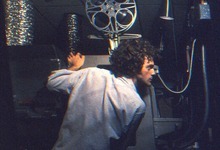 Two 35mm reels of film contain a portrait of a film projectionist projecting and rewinding and projecting and rewinding the same two reels of film. The screen becomes a mirror, revealing the “man behind the curtain”. The lights remain up and the audience is encouraged to amble about the theatrical space, dividing their attention between the live and identically recorded performance. This performance must run for at least twenty minutes and may run for as long as the projectionist wishes.